Maybe off topic but I see a strong link to the underhanded dirty rotten business that is politics and the grab for power. Daniel Bowen’s latest blog post (http://www.danielbowen.com/) on Glen Huntly rail crossing and what the libs are doing should be compared to the 27000 spent by the council libs with Newton’s blessing in trying to get rid of Lobo. He says too much giving away the secret deals made behind closed doors and is Labor. How about spending $27000 on planning instead of in fighting? It’s an election year and, aside from the Councillor’s name, it’s difficult to spot the difference between Council’s disgusting 2012 antics to get rid of a “troublesome Councillor” and what is now happening 4 years later. 2012 it was get Penhalluriack (bullying: charges dropped, illegal rooming house: charges dismissed, partial legal costs awarded against Council) and it worked. Fast forward to 2016 it’s get Lobo re charges re anti-semitism over the Guns in Parks issue. It’s a pure a distraction from the key issue of why did Council secretively exceed their authority and vote for it (8 to 1). Is it going to work? The amount of ratepayers funds expended in external legal fees (despite Council having their own (2) internal legal eagles) in 2012 makes the current $27,000 (and rising) pale into insignificance, However, Councillors persistence is using ratepayers funds for electioneering purposes is reprehensible. Why didn’t you call it like it is ie. ratepayers funds used for a smear campaign. It’s dirty and every Councillor (other than the victim) and senior Administrative Officer should be held accountable. Oh, and by the way why is the Leader fuelling the fire? Advertising revenue? I feel very sorry for this young couple and ever other family that is now finding itself in the same boat because of the zoning. They have got everything out of Bent Street so the next one along is Vickery and after they have got their clutches into Vickery they will move onto the next street along that is zoned for four storeys. Council is doing nothing when a blind man could see what is happening. I suppose that when every street is gone that is when they will start making some noises about introducing a minor amendment or two. Yep, young couples and families caught up in this situation are deserving of sympathy. So, too are the older ones whose family home is now being surrounded by 3 or 4 four stories and are being told they are selfish to remain occupying the location they have lived in for 30-40 years because some developer wants to put 30+ units there.. The only ones not deserving of any sympathy are Glen Eira’s Councillors and Planning Department who after years of failing to undertake proper planning have left the residents high and dry and clearly have no intention of doing anything other than blame others (VCAT and Victorian Planning Legislation). 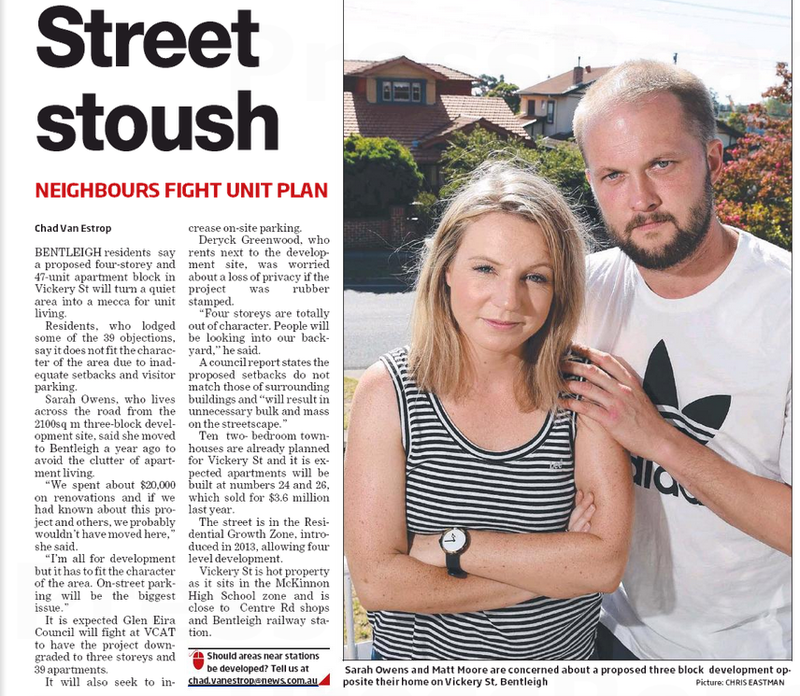 As for the developers street by street march through an area, although Bentleigh is the current favourite, it’s happening across the municipality. One area that has so far been relatively unscathed is Murrumbeena, but given the Carnegie development onslaught that has progressed to Murrumbeena Road, this area is set to tumble in 2017. Hyam and Lipshutz behave like a couple of pseudo-secular, anti non-semitic towncriers. Calling out Lobo for his stupid remarks whilst behaving and thinking in much the same way. This nonsense is doing nothing for the greater governance of Glen Eira. It is time to stop these dumb divisive time wasting pranks and start working together for the betterment of all the Glen Eira community. Rebecca McKenzie can kill the idiocy, or she can kick the can further down the road. The right thing is to kill it. Remind councillors they have an obligation to use council resources in accordance with the Local Government Act. Suggest councillors make an allegation of a breach of LGA or Councillors’ Code of Conduct before wasting our time and money in future. Recommend council publish the secret resolution so we can judge whether it concerned protection of council property, the excuse used to justify closing the controversial “guns” meeting to the public. Audit past council decisions for evidence of racism. You’re a stickler for rules and regulations, while this issue is pure politics and power. The first rule of those in power is to keep it and remove those that oppose them in wielding their power. The major grouping in Glen Eira, the Libs, had an overwhelming hold on power levers for at least 10 years. In that time they have entrenched their power through regulations, secrecy, and behind the scene influence. Voters and residents have no say unless they can convince the power brokers. The result is that those that in the community that have the connections and know how to use thei influence get what they want. Others can get stuffed. The worst part of it is that the Local Government is different to State and Federal Governments in that the 9 Councillors have to co-operate, negotiate, and compromise. Otherwise, nothing is done. That is what is happening over and over in Glen Eira. As for change of Government in Council, there is no such thing like in State sphere. The change would be significant only if in Glen Eira at least 5 new Councillors would be voted in (regardless of political affiliation). How is that likely? Not very, because incumbent Councillors have a great advantage over newby candidates. Have you considered that the way to break the power elite is through the rules and regulations? Overstep the mark and they are history. Is not not the reason Hyams and Lipshutz are going hammer and tongs with Guns in Parks and charging Lobo with being an anti-semite, they are trying to bypass people rational senses by panicing them into voting for their self appointed protectors “you know who” John Howard used these low-brow methods of being elected very successfully. What we have in GE is 2 pint sized John Howards in cheap suites. Re Street Stouch: The Liberals foisted RGZ on the residents of Glen Eira without strategic justification and they lost the subsequent election. That won’t help Vickery St residents though, as Council has clung tenaciously to the changes introduced by Amendment C110, refusing to review its Scheme repeatedly. Even the purpose of the zone has been perverted, with “diversity” meaning lack of diversity. Council hasn’t explained its undocumented change of policy, having previously argued that 2 storeys was appropriate where now it is arguing for 4 storeys. And why did they choose the amenity standards for RGZ that they did if they don’t expect any developer to comply with them? Excellent questions, Reprobate. Why indeed? Your arguments only confirm what I am saying. The real problem is that, while at the State level of Government it is possible to change the Government in the knowledge there will also be a change in policy, in Glen Eira, one elects individuals, not Governments of particular persuasion. Here is the truth about what happened in 2005 http://www.vec.vic.gov.au/Results/gleneiraresult2005.html . There were 61 candidates and 9 elected. Soon after election Cr Lipshutz had a meeting of Liberal councillors at his home. They have decided on policy directions, but more importantly they have decided on political tactics to be employed. One outcome of that meeting was that only Libs could become Mayors. So, the first Mayor was David Feldman Liberal, then Margaret Esakoff Liberal, then Steven Tang Liberal. After 2008 elections we got in succession: Helen Whiteside, Steven Tang, Margaret Esakoff, and Jamie Hyams all Libs. Helen Whiteside resigned in 2010 partly, I believe, because she could not stomach the hypocrisy, lack of credibility and integrity on the part of the other Lib Councillors and in particular Cr Lipshutz (see https://gleneira.wordpress.com/2010/08/13/whiteside-the-dummy-spits-continue/). Most interesting are the comments for this post with Reprobate being most pertinent, in my view. Can anyone tell me what changed since then? The most intriguing part of power wielding Libs is that the ‘kingmaker’ and powerbroker Cr Lipshutz has never bothered to become a Mayor, an authority position with vested power and influence. He clearly understands the benefits and limitations of power, but some of his actions and pronouncements suggest a Machiavellian approach to execution of power ‘we cannot do good without power but we cannot gain power, nor keep it, without doing evil’. This attitude makes a lot of people upset, angry and highly critical of him as expressed regularly on this blogsite. Yet, one must admire the political and professional skill he utilises to get people from Camden Ward strongly supporting him. The question is who can take him on? You have forgotten to mention the repeat ‘consultation’ (including glossy questionnaire) for preserving the Conservatory at Caulfield Park. Residents overwhelmingly voted to restore, yet it went to god. More thousands down the drain! Also the hundreds of thousands spent pursuing Penhalluriack! Yep definitely the Caulfield Park Conservatory, a truly great example of consultation a la Glen Eira. 5 community consultations over a 6 year period, all with a resounding restore and retain vote by the community. The last one included a $15,000 4 page coloured survey, distributed to about 500 residences, which yet again resulted in a resounding retain and restore. Council voted to retain and restore. Less than twelve months later, the conservatory suddenly bobbed up in the agenda and all current incumbent Councillors voted to remove without consultation. WHY, because the fudged costings (bearing no resemblance to previously presented figures) were and every Councillor, especially Delahunty, argued that had residents known the costs they would not have voted they way they did. Sayonara Conservatory and community input into Council decisions. By the way, another great example of community consultation was Frogmore. And the demolition and rehabilitation of the site was estimated to cost $140K, far from cheap in its own right. At least I have my photos and memories from the various occasions I wandered through the conservatory, and Council hasn’t yet found a way to take them from me.